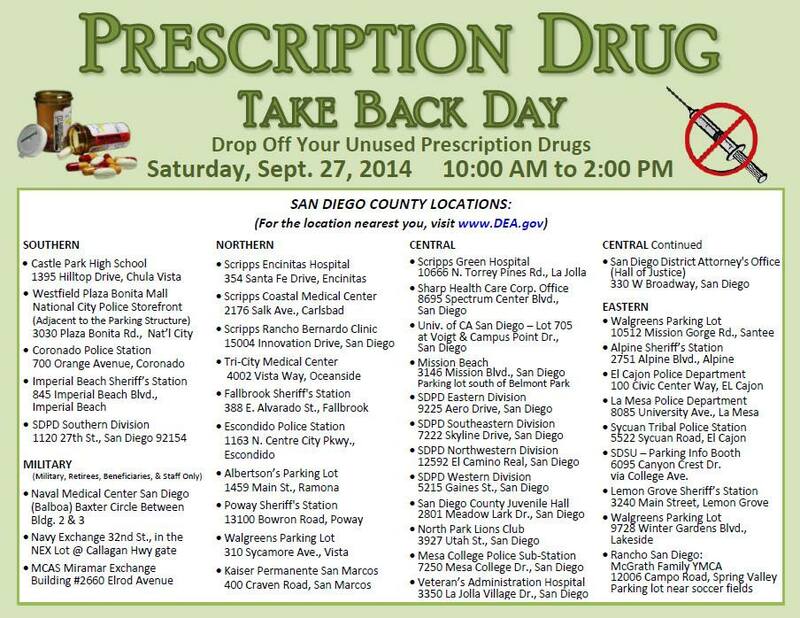 Law enforcement agencies will host National Prescription Drug Take Back Day Sept. 27, 2014. Photo credit: SDSheriff via Facebook. Authorities will be stationed at more than a dozen locations Saturday to collect your unwanted prescriptions so they can be safely discarded. 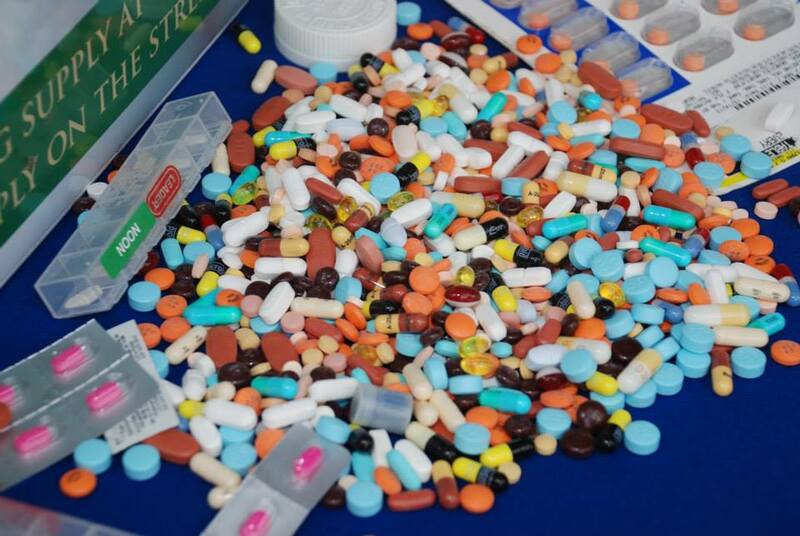 The Drug Enforcement Administration is hosting its ninth National Prescription Drug Take Back from 10 a.m. to 2 p.m. Saturday and there will be more than 40 places locally where residents can hand over their prescriptions. North Park – Lions Club, 3927 Utah St.
La Jolla – VA Hospital, 3350 La Jolla Village Drive. Morena – SDPD West Division, 5215 Gaines St.
Mission Beach, parking lot south of Belmont Park, 3146 Mission Blvd. Coronado – 700 Orange Ave.
Imperial Beach – Sheriff’s Station, 845 Imperial Beach Blvd. Fallbrook – Sheriff’s Station, 388 E. Alvarado St.
Alpine – Sheriff’s Station, 2751 Alpine Blvd. Lemon Grove – Sheriff’s Station, 3240 Main St.
Lakeside – Walgreen’s Parking Lot, 9728 Winter Garden Blvd. Ramona – Albertson’s Parking Lot, 1459 Main St.
“Prescription drug deaths are preventable. Removing temptation is a very important step. 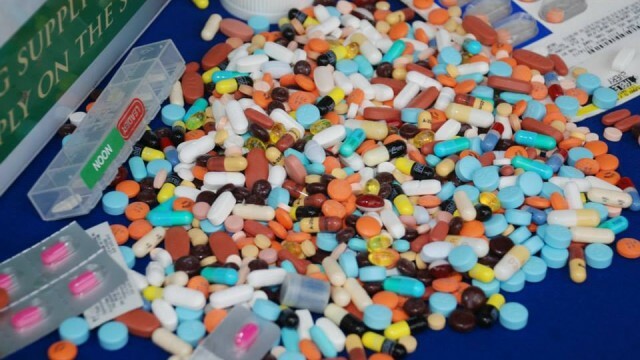 Coupled with treatment options and education we can stop prescription drug abuse,” said county Supervisor Dave Roberts, a member of the San Diego County Prescription Drug Abuse Task Force, in a news release. Last year, the DEA received 9,185 pounds of prescription drugs from San Diego and Imperial Counties during Prescription Drug Take Back Day. Nationally, more than 780,158 pounds of prescription drugs were turned in at more than 6,0o0 locations. 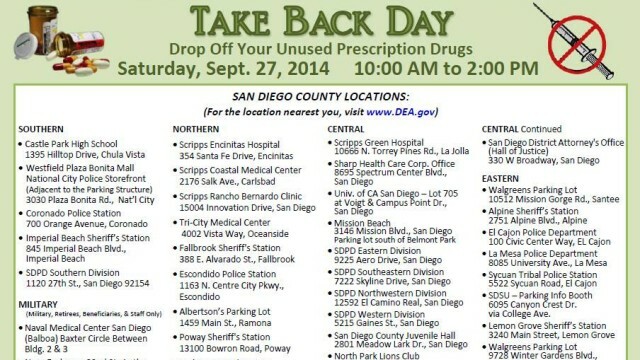 List of Sept. 27, 2014 San Diego area prescription drug collection sites. Photo credit: SDSheriff via Facebook.